The famous trio of Jim Paredes, Boboy Garrovillo and Danny Javier, collectively known as the APO Hiking Society, wrote songs meant to awaken the Filipino's sense of patriotism during the turbulent Marcos regime. Tribute albums have recently mushroomed in the field of Original Pilipino Music (OPM) and music lovers may wonder, is there a shortage of original songs worth recording? Exclude the prolific rock bands from the question, of course. We're talking about music without boundaries, songs that people—young or old, rich or poor—sing any time and remember for years. True, our OPM catalog boasts a wealth of materials written by brilliant Filipino composers. But we usually remember only the singer who successfully interprets a song in his or her own style. Some present-day composers do gain popularity; on top of their creativity in songwriting, they have an appealing voice to render their own compositions. Lest we forget, however, that behind every song is a songwriter, let's recognize as well the silent composers who remain behind the scenes or outside the recording studio. PEP (Philippine Entertainment Portal) pays homage to Filipino songwriters—performing and non-performing—who helped shape and revolutionize the OPM landscape through their musical genius. LEVI CELERIO. The Tondo-bred songsmith passed away on April 2, 2002 at the age of 91, leaving to posterity 4,000 original songs. A versatile composer, Celerio produced folk music, Christmas carols and love songs. To this day, many of his works outlive him in the hearts of Pinoys everywhere. His nostalgic lullaby, "Sa Ugoy ng Duyan," is timeless. Levi Celerio started as a folk lyricist, churning out some of the most familiar tunes in the OPM folk catalog like, "Ang Pipit," "Tinikling," "Tunay na Tunay," "Itik-Itik," "Waray-Waray," and "Pitong Gatang." Some of his more commercial creations include "Saan Ka Man Naroroon?" "Kahit Konting Pagtingin," "Gaano Ko Ikaw Kamahal," and "Sapagkat Kami'y Tao Lamang." Celerio's genius is also heard every Christmas season through his carols "Pasko Na Naman," "Maligayang Pasko at Manigong Bagong Taon [Ang Pasko Ay Sumapit]," and "Misa de Gallo," which have become as traditional as the yearly celebration itself. Levi Celerio was declared National Artist for Music and Literature on October 9, 1997 and lauded thus: "His music was a perfect embodiment of the heartfelt sentiments and valued traditions of the Filipino." GEORGE CANSECO. This gifted artist is best known for his heart-on-sleeves compositions. A University of the East alumnus, George Canseco worked as a journalist for the Philippines Herald and Associated Press before deserting the newsroom to concentrate full-time on songwriting. The suppression of press freedom during martial law in the '70s drove Canseco to make a career shift. His passion for music actually started much earlier. Deprived of a formal music education, the young Canseco taught himself to play the piano and render tunes by ear. A sentimental man, he freely exposed his heart through music that pushed the romantic buttons of his kababayans. Some of his popular creations are "Kapantay ay Langit," "Ikaw," "Gaano Kadalas ang Minsan," "Paano," "Hanggang sa Dulo ng Walang Hanggan," "Hiram," "Kastilyong Buhangin," "Kahapon Lamang," "Dito Ba?" and "Rain." He also composed the popular movie theme songs, "Langis at Tubig," "Kung Ako'y Iiwan Mo," "Paano Ba ang Mangarap,""Dapat Ka Bang Mahalin," "Hihintayin Kita sa Langit," and "SinasambaKita." All in all, Canseco wrote more than 300 songs. He is also credited for catapulting the singing careers of Basil Valdez, Zsa Zsa Padilla, Pilita Corrales, Dulce, Kuh Ledesma, Regine Velasquez, and even Sharon Cuneta. NICANOR ABELARDO. A true Bulakeño at heart, Nicanor Abelardo weaved poetic lyrics that raised the kundiman genre to art-song status. Abelardo's background cultivated in him a love for arts and music. At five, his father taught him the solfeggio and the banduria. He created his first song when he was eight, titled "Ang Unang Buko," which he wrote for his grandmother. Since then, Nicanor never let up and by the time he was thirteen, he was already a fixture in various saloons and cabarets around Manila. Abelardo concentrated mainly on kundiman but he incorporated subtle pop elements to make his music appealing to a wider audience. His well-loved creations are "Bituing Marikit," "Kundiman ng Luha," "Mutya ng Pasig," and "Nasaan Ka Irog," and others. Some of Nicanor's works eventually became movie theme songs. Years after his passing, Ryan Cayabyab picked "Mutya ng Pasig" and rearranged it for Kuh Ledesma. His composition "Naku... Kenkoy!" written in 1930, was the inspiration behind the hit Komiks character, Kenkoy. WILLY CRUZ. Willy Cruz will always be remembered for the songs "Araw-Araw, Gabi-Gabi" and "I'll Never Ever Say Goodbye"—two songs that raised the stock of Nonoy Zuñiga and Didith Reyes, respectively. But what made the Manila-born composer a force in the local music scene were his movie theme compositions such as "Kung Mahawi Man ang Ulap," "Maging Akin Ka Lamang," "Pahiram ng Isang Umaga," and "Himala ng Pag-ibig." The singer who benefited most from Willy's talent was no less than Megastar Sharon Cuneta. Willy's brilliance in weaving dramatic melodies greatly complimented most of Sharon's unforgettable films, making her a certified mass darling. "Bituing Walang Ningning," "Sana'y Wala Nang Wakas," and "Bukas Luluhod ang mga Tala" were all Willy Cruz's creations that, just like the movie itself, withstood the passing of time. RYAN CAYABYAB. He is arguably the most popular Filipino composer of modern times. Ryan's credentials continue to grow throughout the years as he tirelessly explores other avenues for his art. That's probably why his fellow musicians, music students, and people in general call him The Maestro. Through the years, Ryan Cayabyab has gone into jazz, theater, and pop to cover all listening bases. He even incorporated ethnic music in "Misa," "Kapinangan," and "Maria Makiling." But like other composers, The Maestro knows the importance of churning out a commercial hit to gain a large audience. He endeared himself to the public through his radio-friendly compositions like "Araw Gabi," "Iduyan Mo," "Kay Ganda ng Ating Musika," "Kailan," "Kumukutikutitap," "Minsan ang Minahal ay Ako," "Liman-Dipang Tao," "Wala Kang Katulad," and "Tuwing Umuulan at Kapiling Ka." Cayabyab's works are often praised for their poetic yet easy to grasp word play mirroring the plight of the common tao. FREDDIE AGUILAR. Freddie Aguilar is probably the closest we could have of Bob Dylan. Like Dylan, Freddie was responsible for taking folk music to the top of the mainstream charts with his groundbreaking single, "Anak." This song about parents' unconditional love for a wayward son was released in 56 countries and translated into more than 26 foreign languages. Freddie revealed that "Anak" is a thinly veiled personal account of his tumultuous relationship with his father who was upset when Freddie opted to be a musician instead of pursuing his dad's dream for him to be a lawyer. After running away from home with his trusted acoustic guitar, Freddie returned home broke and in bad shape. Fortunately, his parents had already softened up and they welcomed him back. Legend has it that when Freddie's dad read the lyrics of "Anak" all the bitterness melted away and they became close. But their reunion was short-lived. Freddie's dad died soon afterwards. Although undoubtedly his biggest song, Freddie Aguilar's career is more than just "Anak." Freddie's folk leanings shone even more with the songs "Magdalena," "Bulag, Pipi at Bingi" and "Olongapo." His later hits include "Ipaglalaban Ko," "Kamusta Ka," "Minamahal Kita," and the electrifying "Estudyante Blues." It was Freddie Aguilar who wrote the 1986 EDSA People Power anthem, "Bayan Ko." APO HIKING SOCIETY. Although they're pretty well off, the trio of Jim Paredes, Boboy Garrovillo and Danny Javier—popularly known as the APO Hiking Society—have enough street credibility to write songs that touch the pulse of the masses. 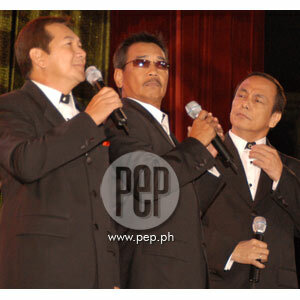 Jim, Boboy and Danny wrote songs about society, mundane experiences, friendship and love. But what made the trio unique were their insights on commonplace situations, rendered with irreverent humor, as in "Pumapatak ang Ulan," "Salawikain," "Mahirap Magmahal ng Syota ng Iba," "American Junk," "Paano," and "Yakap sa Dilim." The group also gained reputation as performers with a social conscience during the Marcos dictatorship with their protest songs, "Hindi Ka Nag-iisa," "Piece of Peace," "Tuloy ang Ikot ng Mundo" and "Sasaya ang Pilipinas." During the 1986 EDSA revolt, Jim Paredes wrote the moving "Handog ng Pilipino sa Mundo" as a tribute to the Filipinos' courage and heroism.